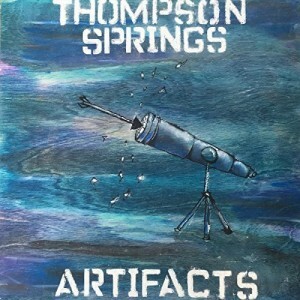 A collaborative side-project from The Sharrows’ Matt Smith, Thompson Springs became an outlet for a backlog of songs Smith gathered over the years. Named after a ghost town in Utah Smith encountered early in his song-writing career, the band consists of a rotating crew who shaped his tunes into folk-rock gems whose casual valor, languid language and modest polish convey an everyman’s candor that rocks gently and goes down easy. Produced by Rob Laakso of Kurt Vile and the Violators, the mini-collection of rambling self-reflection simmers in sing-along homilies and hitch-hiker’s poetry for a laid-back and breezy treatise that makes for a fine traveling companion on the winding road of life. As a taste of things to come, “Artifacts,” packs promising calm for uncertain journeys.